The best of Shimla Honeymoon Packages are available to take you to the deep valleys, thrilling gorges, mild rivers and majestic mountains providing you a completely breathtaking view in the mesmerizing region. If you want your love days celebration hassle free, just go for the best Honeymoon Package in Shimla. Shimla possesses a number of marvelous attractions such as temples, churches, monuments as well as primitive buildings to make your Honeymoon a much memorable and enjoyable moment for you both. So, you should not miss out visiting each and every attraction, hand in hand with your special one during your honeymoon. You need not bothered about your accommodation in the gorgeous region as a wide range of hotels and resorts are available to offer you the best stay. Some of the best such hotels and resorts are Toshali Royal View, Shilon Resort, Park Woods Resort, Ashiana Regency, Springfields, Hotel Sukh Sagar and Hotel Leela Regency, among others. Your shopping needs are fully satisfied at the famous The Mall in Shimla. Other amazing attractions in Shimla are the Jakhoo Temple, the Tara Devi Temple and the Christ Church, to bring you with a religious feel. 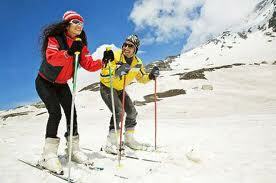 Making your tour so easy and convenient, a wide range of honeymoon in Shimla are offered here. Avail them to make your honeymoon much interesting in the beautiful region.